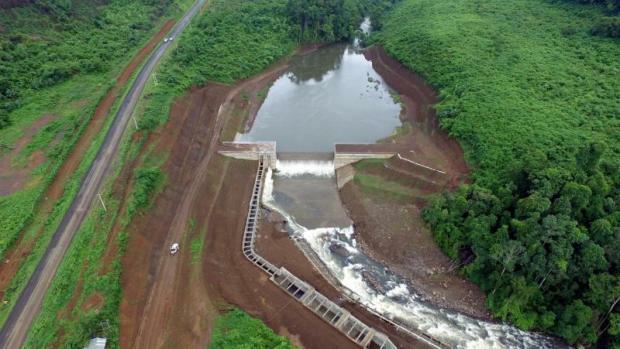 An aerial view of a B.Grimm hydropower project in Laos, where the company aims to build more power-generating projects. Champasak, Laos: B.Grimm Power Co, a unit of B.Grimm Group, plans to invest 17 billion baht in 2017-18, including for the development of hydropower in neighbouring Laos. Of the total, around 1.8 billion baht is for the development of eight hydropower plants with a combined power-generating capacity of 12.6 megawatts, said president and chief executive Preeyanart Soontornwata. She said two of those are the Xenamnoy (Phase 2) and Xekatam (Phase 1) projects, both located in Champasak province and still under construction. They are scheduled to start commercial operations on June 30 this year. The company signed a 25-year power purchase agreement with Electricite du Laos to supply the power generated by hydropower plants to Laos’ state utilities. The other six hydropower plants in Laos are also under construction. They comprise Nam Che 1 with a capacity of 15MW, Nam Khao 1 with 15MW, Nam Khao 2 with 15MW, Nam Khao 3 with 15MW, Nam Khao 4 with 15MW and Nam Khao 5 with 7.5MW. “The company expects these six hydropower plants in Laos will start commercial operations by 2019. This excludes Xenamnoy Phase 2, with capacity of 6.7MW, and Xekatam Phase 1, with capacity of 13.1MW,” said Ms Preeyanart. The latter two plants are to be operated by Xenamnoy and Xekatam Hydro Power Co, a joint venture between B.Grimm Power (Laos) Ltd and SV Group Ltd, a leading engineering company in Laos. She said B.Grimm Power expects its total power-generating capacity to rise to 2,356MW by 2021. The total is projected to include 2,111MW from renewable power, mostly large hydropower plants, 114MW from solar farms, 102MW from small hydropower plants, 16MW from wind farms and 13MW from diesel. The company operates 28 power plants, including 12 generation combined-cycle plants, mostly hydropower, 15 solar power plants and one diesel power plant, with a total capacity of 1,626MW. B.Grimm Power aims to increase the proportion of renewable energy to 20% of total consumption in the country by 2036. For its power plant investment projects, the company expects to raise funds in the Stock Exchange of Thailand in May as well as use project finance. Ms Preeyanart said B.Grimm Power also plans to invest in several projects with high potential in Asean countries such as Laos, Indonesia, Vietnam, Myanmar, Malaysia, Cambodia and the Philippines. “The company is interested in investing in coal-fired power plants in Indonesia, where there is room for the industry to grow,” she said. Over the next five years, B.Grimm Power aims to increase the proportion of overseas revenue to 30% of the total, up from around 10%, said Ms Preeyanart.